At our last weekly Oasis team meeting I was hoping to find out how Oasis might be introduced to newcomers beyond naming hospitality as making space – our prime motif. “Oasis is a listening-post!” suggested Maureen Howland. She was making connections with a Mental Health First Aid course she had just attended. So we took to the whiteboard. An hour, and bowls of soup, with bread, cheese and tomatoes later, we had come up with a picture of what we reckon we do at Oasis. Charles thought that the various elements form a cycle, so we put the elements into some kind of order. When we had exhausted our ideas and discussion, Charles took a photo of the whiteboard, emailed it to me and I created the simplified design above – The Hospitality Cycle. 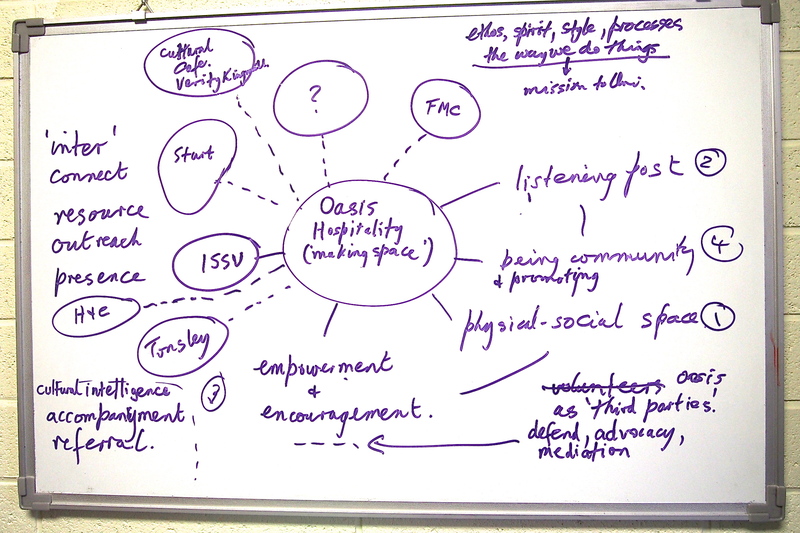 The leftover thoughts seemed to me to describe aspects of the intent of Oasis, so I gathered them into another diagram – ‘Oasis as an Inter-agency’. In this post I would like to discuss what lies behind these categories. If radical hospitality, understood as making space, is at the heart of Oasis then we begin with the creation of physical and social space – Oasis as a place in which students feel at home, a place one enjoys being in, a place of warmth and friendship, and where the kettle is always on for a free cup of tea or coffee. It’s an inviting place where we make contact – meeting others as well as having the opportunity to make contact with our inner selves. For the Oasis team, the next step is listening – holding on to our own opinions to make emotional and intellectual space for the other to articulate their thoughts, their feelings, their opinions. That’s not easy when we think we can easily see what could be done to help a painful situation. But rather than giving advice, we continue the listening to allow the other to go further or deeper in their verbal thinking and to begin to see a picture emerging in which they might be able to find a way through. Of course, such listening is not just confined to trouble and pain. More often than not, those who come through the front door of Oasis want to share a joyous occasion. But one thing is for sure, everyone has something they’d love to say, if only they could find a respectful, safe and supportive place to say it! As Nouwen says, “We will never believe that we have anything to give unless there is someone able to receive”. This listening is hopefully encouraging to the other – whether it be as solutions to problems become apparent or ideas for celebrating achievements emerge. The actions that begin to frame in their minds as a result of their verbalisation continue to be encouraged through supportive listening. We want them to know that they are not alone. Whether they are able to access other sources of support or not, the bottom line is that we will support them as they move forward in their plan of action. And if there are issues beyond our competence, if a person needs more intensive support, we identify sources of such intervention and support and ensure they make the connection. It might also mean that we offer to stand with a person as their advocate, or to stand between persons as mediators as well as accompany a person to an appointment. But whatever the result of the listening and the encouragement and any action that arises, we accompany the person. This is no mean commitment – accompaniment is likely to be a sustained process of remembrance and effort in keeping contact, while such contact is called for. But in a world short on friendship, remembrance is a gift Oasis may offer. The act of remembrance that is at the heart of accompaniment creates a sense of diasporic community. So perhaps it is not surprising that those who experience this kind of hospitality want to keep connected with Oasis in some way. Some even indicate that they want to take their experience of hospitality and offer it to others. They become members of the Oasis team or, if they are leaving Flinders, become Oasis ambassadors. Oasis enacts and models the practice of hospitality and by it’s very existence, promotes it. This may take us back to the beginning of the cycle, as new contacts are made, attracted by the hospitality of Oasis. When these contacts are outside the realm of Oasis, the process of hospitality may lead to partnerships or collaborations with other agencies. Oasis can act as a hospitable go-between or facilitator. It can share its experiences of the hospitality process with others and enable others to achieve their own goals. The Faith Friendly Charter, for example, is a resource that emerged from Oasis and reflects its values; and Oasis team members may be called upon to assist others who want to implement it. For example, the concept of faith friendliness and the Charter have encouraged Woodville High School to pioneer a multifaith approach to chaplaincy within their school and I continue to accompany them on their quest. A parallel example of this is enacted by the MoTiv team at Delft Technical University, who, among other roles, act as film producers. The role of a film producer enables someone else’s script to come to life. So they act as producers on behalf of departments or students of the university, value adding to the university. For example, a documentary of a final year engineering student engaged in his final project becomes a source of discussion among the Engineering staff – the challenges such a project poses for students beyond the field of engineering itself. And it becomes a source for discussion among students – coping with failure, resilience, imagination and the creative process. So now we stand open for comment about the model that is emerging. It suggests to me ways forward for identifying who comprises the Oasis team and what training needs we may have as a learning community. This entry was posted in Uncategorized on July 23, 2013 by Geoff Boyce.